I’ve often had a go at our dietary choices. I lament our insistence on eating carbohydrate-laden foods when we live on a tiny archipelago. Should we not be all about fish and salads and olive oils and all the other pretty dishes that are on the cover of books entitled ‘Mediterranean food’? I’m the first to point out the hypocrisy of my own statement. I love pizza. If I gazed at the horizon and saw a gigantic ball of rock about to destroy our planet, I’ll probably try to fit a pizza into my system, hoping that there’s still some in my mouth when it’s my turn to disintegrate. I love pasta and bread and everything you can prepare with them. Well, of course I do. I was brought up on an island where these are pretty much staples and travel to countries just north of us as often as I can in search of excellence in the pizza and pasta categories (among others). Last week I went out of my way, an hour out of my way, to sample what was touted as the best bowl of ramen in London. It wasn’t. So, I persevered, and found happiness at the bottom of a bowl of carbohydrate-in-soup at a relatively unknown little place. I won’t be telling anyone about it. But shouldn’t we be eating more fish? Is it not what we’re about? I was brought up in a small fishing village in what felt like the 1930s and fishing was pretty much the core concern of everyone (everyone being old men and my dad) who met at the village kiosk every summer evening. But then flats and doughnut shops and supermarkets happened to the place and it turned into another sadly unremarkable village with very little reference to its roots. I shared this lament with a fisherman in Spinola bay the other week. I was watching as he patiently hooked his lines in preparation for the next bout of encouraging weather and we got chatting. For a man who proclaimed himself illiterate, he has a powerful grasp of the politics and the economics of fishing and how he’s had to adapt to keep up. He schooled me on the differences between fish farming and fish ranching and gave me a decade-by-decade account of the changing shape of the industry from his point of view. Swordfish, by his account, is all but extinct. We know fishermen are prone to exaggeration – ask them the size of the biggest fish they’ve caught and they’ll compare the weight to that of a small truck – but there is no doubt that we should be responsible when consuming fish. How are we expected to be responsible and yet consume more fish? Well, it is a sensible dietary choice. You will live longer, healthier, and smarter by swapping a couple of pasta dishes for fish dishes every week. Which fish to pick will make you more responsible. Eating salmon, for instance, makes little sense when you’re in Malta. The fish has been farmed elsewhere and flown in at an unreasonable consumption of resources while local shoal fish go largely ignored. My advice would be to focus on one of the essential relationships in your life – that you have with your fishmonger. Explain that you want to eat responsibly sourced fish. They will know what to do. If you’re in doubt, do your research and challenge their knowledge. We all know that a rocky interlude can make for a stronger relationship. I go a step further. I have a standing arrangement with the butcher and fishmonger of my choice. If I like the ingredients they sell me, I make it a point of saying so the next time around. I do so loudly and profusely so everyone else in the shop hears how good they’ve been to me. If I don’t like what they’ve sold me, I go back and wait while they eat it. To many, buying, preparing, and cooking fish is a chore. And to many others, eating fish at a restaurant is simply too expensive to be a regular occurrence. The solution lies somewhere in between – that of finding an eatery that will prepare fresh fish for you to take home. It takes out the expense of running a proper restaurant for them and the rest of us eat more fish at home. I’ve tried one little gem of this nature a couple of times. 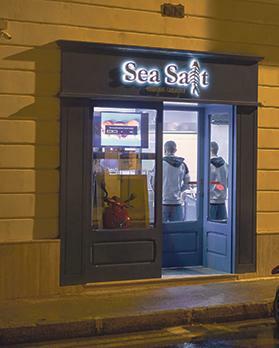 Sea Salt in Sliema does just that – they offer a reasonable menu of mainly fish-based dishes that they purvey on a solely take-away basis. Doing away with tables axes the expenses, allowing them to retain very keen pricing. My first foray involved a lovely octopus and chorizo burger. 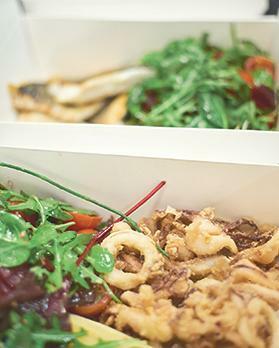 Octopus marries spicy sausage so well – try it with ‘Nduja if you ever get the chance to. The burger was a proper treat, with a sweet tomato relish and fresh salad inside for huge flavours. Octopus is brash, chorizo is shameless, and the ripeness of the relish sweetens the deal quite literally. I was impressed and had to try out the fish. Only that octopus-burger time I’d waited for what was probably 20 minutes that felt like an eternity when hungry. This time around I called in advance and spoke to a friendly and uncannily well-informed young lady on the phone. Her cheerful will to help while taking the order is a demeanour that much of the industry can learn from. I was a 10-minute drive away and she’d said they needed 15 so I took my time getting there. When I did, I was told they’d had a bit of an issue and that they needed another 10 minutes so I waited there. The man who does all the cooking and the young lady who’d taken my order make a great team and there’s an enthusiastic and happy spirit to the place as a result. I spoke at them as they worked and, instead of asking me to shut up like the rest of the world so rightly does, they returned with friendly banter and a very informed conversation about the fish they had on offer. Fifteen minutes later I walked out with boxes of warm fish and a heavenly scent wafting up from them. My attempts to drive like I’d stolen a car were thwarted by inconsiderate drivers who wouldn’t step on their accelerators despite my precious cargo. By the time I made it home, the fish had started to cool and I hadn’t thought of warming plates. I took a split-second decision and a long-lasting commitment. The decision was to eat out of the cardboard box, knowing it to be a better insulator of heat than the cold, ceramic plates that would surely ruin the fish. The long-lasting commitment was to warm plates before I left the house the next time I ordered from Sea Salt. Chuck them into the oven at its lowest setting and drive. My tuna steak was bang on the money with cooking temperature. The chef had asked if I liked it done medium and I asked for medium-rare, which he delivered. It is very simply seasoned with a decent olive oil and this works for such a flavoursome fish. It wasn’t the best tuna I’ve eaten and this is not down to the preparation. Competition for the best fish is so fierce, with the choicest ones being exported, that we get what the market offers. The salad was actually a salad. I’m so used to a side-salad being treated like a garnish, with a couple of sad leaves placed there for colour, that I have no expectations in this department. Not so at Sea Salt – the dressing is slightly sweet and present throughout, the baby leaves are fresh and crisp, and there’s colour, flavour, and texture coming from capers, beetroot, black olives, nuts, and cherry tomatoes. Next, I dipped into the box of fried calamari. The squid is lovely and lightly battered, once again seasoned with restraint that I appreciate. This box had chips in it and they’re probably even better than the squid. As much as I tried to stick to the salad, I couldn’t stop returning to them. Just as lovely was the pan-fried sea bass, with a beautifully crisp skin and moist flesh, packed with the flavour of its own oils. The portion is generous, too, particularly considering what we were paying for it. All three dishes cost €35. That’s just over a tenner for every dish, a price we’d pay at a franchise fast-food joint for a rather depressed hamburger. Which makes me think that the only thing that can improve Sea Salt is actually turning into a franchise. The only flaw in the Sea Salt model is the distance one has to travel while your fish is losing its freshness and temperature. Having a Sea Salt in every village the way pastizzi are ubiquitous could go a long way towards a healthier, happier nation. So, Sea Salt, do you have what it takes?